Scotland's heraldic authority, the Court of the Lord Lyon, has appointed its first honorary vexillologist. 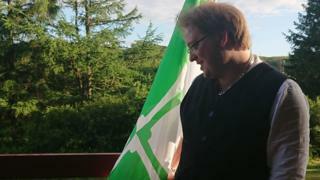 Philip Tibbetts will be responsible for supporting communities across Scotland wishing to develop their own flags. He will also assist with flag inquiries from the public, clans and local government. The Court of the Lord Lyon, based in Edinburgh, is one of the oldest bodies responsible for protecting intellectual property in the world. It is responsible for recording and protecting personal and corporate coats of arms as well as Scotland's national symbols. Vexillology is the study of flags and related emblems. Mr Tibbetts has been involved in the past in supporting community projects to create flags that reflect an area's history, and to have the banners officially recognised. These have included flags for Caithness, Denny and Dunipace and Kirkcudbrightshire. Mr Tibbetts also supported the effort to have the flag for Barra and South Uist officially recognised. The Isle of Tiree flag competition is currently open for voting of a winner. Mr Tibbetts, who read philosophy at the University of St Andrews, said, "It is a huge honour to have been appointed as the Lyon Court's first honorary vexillologist. "I am looking forward to continuing my work with communities across Scotland and working more with councils and clans." Lord Lyon said, "I am looking forward to working with Philip in his new role to promote the great traditions of Scottish Heraldry. "His appointment engages the next generation in this work and will bring to the fore a growing area of heraldic interest."